Do we even have to explain the importance of this question? Any respectable wedding caterer should be able to provide a valid food and liquor license as this means they have met the necessary health department standards. After all, you give them a green light to provide food and drinks for your closest family and friends, so safety should be your first concern. Just like choosing any other wedding service, you might want to know about their former clients’ experience. So, it’s a good idea to get a few references (preferably ones with similar reception menu styles). This way, you will hear other people’s opinion on what it is to work with this particular caterer and base your decision on that as well. What food do you specialize in? If you are planning a gluten-free reception menu for your wedding, for example, you will prefer your wedding caterer to be familiar and experienced with such foods, won’t you? If you choose a caterer who specializes in the type of food you want served at your wedding, you must be sure that the result will be a tastier and better-looking menu. What does your service include? Do you offer different packages? 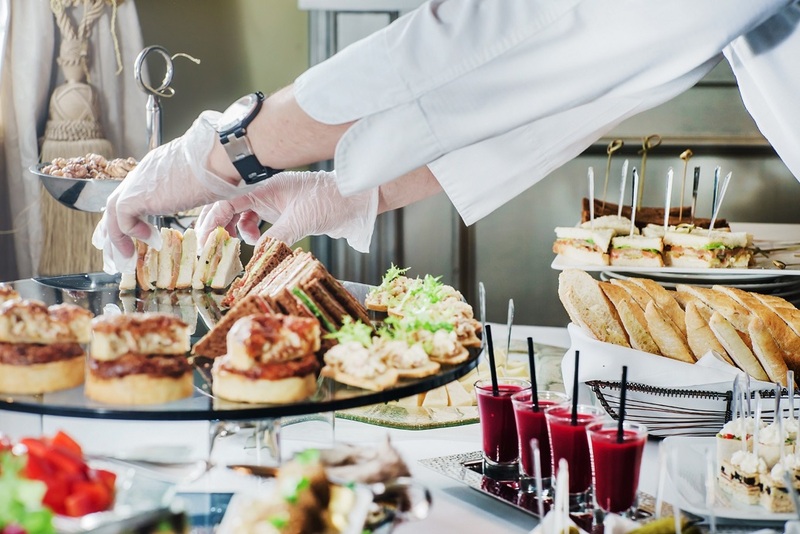 You may find it surprising but not all wedding caterers offer full service, so you need to be sure what’s covered and what’s not. Think in terms of table settings, bar service, cleanup, waiters, etc. If any of these are not included in the standard offer of the caterer, ask if you could get them at an additional cost. Do you work with special dietary restrictions? At a wedding, there is rarely a case in which all guests eat the same food. As there are almost always wedding guests with special dietary preferences (vegetarians, vegans, gluten-free, etc. ), it will be an added bonus if your caterer can handle them as well. If yes, you should ask if this comes at an additional cost as well. How do you proceed with tastings? Most caterers offer tastings prior to sealing the deal and this is only natural. After all, it is one thing reading rave reviews about the food and another tasting it yourself. How do you charge for the bar? If your caterer provides a bar, you have to know how they charge for it. They might have a set fee per person or charge by the amount of alcohol consumed. Either option can work for you and it all depends on your preferences and your wedding guests, of course. You know your wedding guests best so it is up to you to decide which option will be less costly.